South Africa Considers Legalizing Domestic Rhino Horn Trade : The Two-Way Conservationists are sounding the alarm over a South African proposal that would legalize and regulate the domestic trade of rhinoceros horn, as well as allow some limited exports. Three rhinos line up at the Welgevonden Game Reserve on Wednesday in South Africa's Limpopo province. Conservationists are sounding the alarm over a South African proposal that would legalize and regulate the domestic trade of rhinoceros horn, as well as allow some limited exports. A public comment period ended last week on the draft regulations from the Department of Environmental Affairs, published on Feb. 8 in the official government gazette. "South African rhino breeders want the government to legalize the sale so, they say, they can flood the market and decrease the cost of rhino horn," reporter Peter Granitz in Pretoria tells NPR's Newscast unit. "They argue that would drive down demand for poached rhinos." However, Granitz says conservationists opposed to the regulation say this "makes no sense because there's no domestic demand. 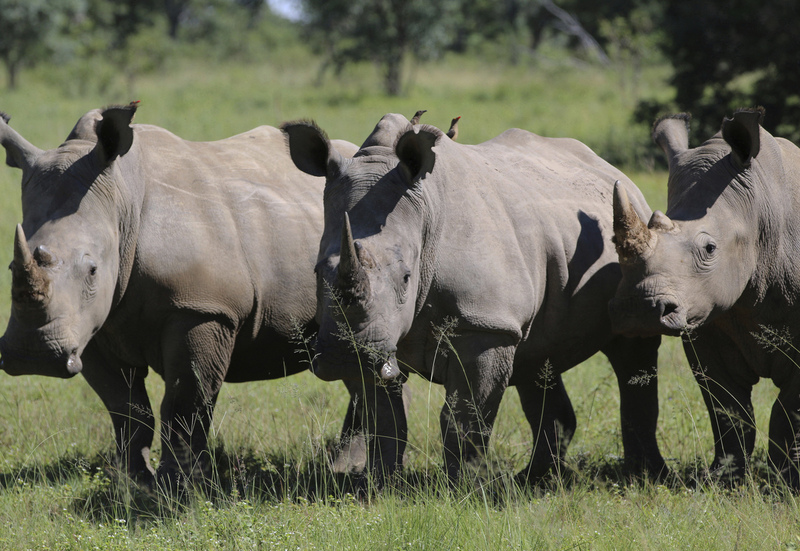 Any horn sold locally would be smuggled to Asia, where demand for rhino horn is booming." The proposed regulation would legalize domestic trade of rhino horn, and allow for foreigners with a permit to export no more than two horns for "personal purposes." The draft did not elaborate on what "personal purposes" means. Individuals traveling with horns may only go through the O.R. Tambo International Airport and may not take them in their hand baggage. They must present freight agents with genetic profile information of each horn, according to the regulations. A separate proposed regulation would ban powdering a rhino horn for a period of three years, noting that powdered horn is more difficult to identify and easier to smuggle. "The public comments need to be reviewed, and Parliament would need to pass a law. So any change could take several months," Granitz reports. South Africa imposed a moratorium on the domestic trade of rhino horn in 2009. The issue has been in the courts on and off for years. Poaching is a huge problem in South Africa, with more than 1,000 rhinos poached in 2016, according to government figures. "These criminal gangs are armed to the teeth, well-funded and part of transnational syndicates who will stop at nothing to get their hands on rhino horn," said Minister of Environmental Affairs Edna Molewa. She said the government was cracking down on poaching, beefing up security and arresting perpetrators. "Banning the trade in horn has made the horn more and more and more valuable. Had we never banned it, the price of horn would never have got to where it is now," John Hume, a rhino breeder in South Africa, told The Associated Press. But conservationists say the envisioned rhino horn trade system actually empowers criminals. As the Species Survival Network wrote, the legal trade "provides a cover for illegal exports" and is difficult to enforce. Rhino horn is in high demand for its use in traditional Asian medicine, though rhino advocates argue it has no medicinal value. Demand has driven up the price — a French zoo that was victim to a recent poaching attack said that in 2015, a kilogram of rhino horn sold on the black market for nearly $54,000. In what is believed to be a first in Europe, poachers entered France's Thoiry Zoo on March 7, killed a white rhinoceros and sawed off his horn. "Zoos around the world should be on alert. I think all rhinos are under threat whether they're in zoos or in the wild. " CeCe Sieffert of the International Rhino Foundation told NPR. "And so if the trend continues, we might lose rhinos in our lifetime."